Coconut oil is a popular superfood that is extracted from the kernel of mature coconuts. It is also harvested from the coconut palm (Cocos nucifera). According to a new interdisciplinary study published in mSphere, coconut oil can effectively control the overgrowth of the fungal pathogen called Candida albicans (C. albicans) in mice. 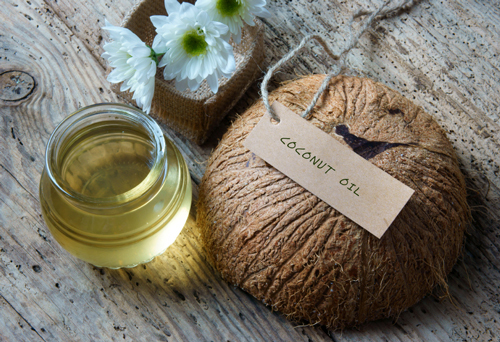 Researchers at Tufts University suggest that coconut oil may be an effective alternative dietary approach to antifungal drugs to help reduce infections caused by C. albicans. The study is a first step toward understanding how a specific type of dietary fat can reduce life-threatening yeast infections like C. albicans. C. albicans is a normal part of the gastrointestinal tract’s flora and the regulation of the immune system. On the other hand, allergies, high-sugar diets, and certain medications can kill the good gut bacteria and allow the C. albicans to grow throughout the body. High levels of C. albicans in the gastrointestinal tract can lead to yeast infections and systematic candida, which affects the whole body. Antifungal drugs like clotrimazole, econazole nitrate, and miconazole can reduce and control C. albicans in the gut; however, drug-resistant strains to fungal pathogens may occur from the repeated use of antifungal medications. It is important to reduce C. albicans in the gastrointestinal tract to prevent infections related to C. albicans. For the study, the research team evaluated three dietary fat sources of C. albicans, soybean oil, beef tallow, and coconut oil, in the guts of mice. Mice in the control group were fed typical mouse diets. Coconut oil had been chosen for the study based on previous research. In a 2007 study published in the Journal of Medicinal Food, researchers discovered that coconut oil was beneficial in the treatment of fungal infections. The lauric acid found in coconut oil is a rare fat that converts to monolaurin—the compound responsible for killing fungus and bacteria. The current study found that a diet high in coconut oil can reduce C. albicans in the gut better than soybean or tallow-rich diets. A diet high in coconut oil alone, or beef tallow and coconut oil lowered C. albicans in the gut by over 90% when compared to a diet high in beef tallow. The coconut oil also decreased fungal infection when the mice had switched to coconut oil from beef tallow. One caveat with coconut oil is that it contains 92% saturated fat; however, it doesn’t contain your typical saturated fat. It has medium chain triglycerides, which metabolize differently and help benefit various diseases. Furthermore, various studies have even proven that saturated fats don’t clog arteries. Coconut oil has also been found to treat several other health conditions, including eczema, acne, psoriasis, Alzheimer’s disease, poor thyroid function, obesity, seizures, digestive disorders, high cholesterol and heart disease. Gunsalus, K., et al., “Manipulation of Host Diet To Reduce Gastrointestinal Colonization by the Opportunistic Pathogen Candida albicans,” mSphere, 2015; doi: 10.1128/mSphere.00020-15. Gallagher, S., “Study in Mice Suggests Coconut Oil Can Control Overgrowth of a Fungal Pathogen in GI Tract,” TuftsNow web site, November 18, 2015; http://now.tufts.edu/news-releases/study-mice-suggests-coconut-oil-can-control-overgrowth-fungal-pathogen-gi-tract. Gunnars, K., “10 Proven Health Benefits of Coconut Oil (No. 3 is Best),” Authority Nutrition web site, http://authoritynutrition.com/top-10-evidence-based-health-benefits-of-coconut-oil/, last accessed November 18, 2015. Siri-Tarino, P.W., et al., “Meta-analysis of prospective cohort studies evaluating the association of saturated fat with cardiovascular disease,” The Americans Journal of Clinical Nutrition, 2010; doi: 10.3845/ajcn.2009.27725. Ogbolu, D.O., et al., “In vitro antimicrobial properties of coconut oil on Candida species in Ibadan, Nigeria,” Journal of Medicinal Food, 2007; 10(2): 384-387, http://www.ncbi.nlm.nih.gov/pubmed/17651080.